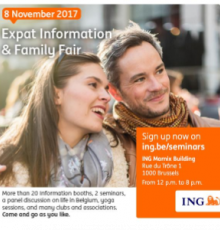 The event will take place on 8 November 2017 at ING Marnix, which is easily accessible from the Trône/Troon metro/bus stop. Registrations start at 12:00, and from there visitors can enjoy free catering and drinks and become familiar with the various international clubs, associations, schools and service providers specifically geared to expats. There is also a Kids Corner, where caregivers will entertain your children while you attend the fair. And finally, the day closes with networking and a cocktail.